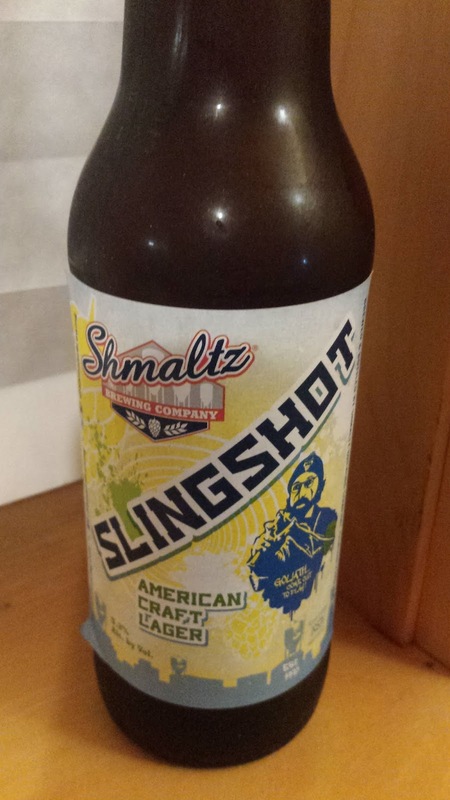 This week's Sunday Night Suds looks at Shmaltz Brewing Company's Slingshot Lager. If you have ever seen their products in beer stores, then you know that Shmaltz is into shtick. In fact, they have a mix box which is called Shtick In a Box as well as another mix box called the No Shtick Variety Pack. Our Fermented Tribute to the Glories of the Underdog.A tasty and clean craft lager for craft ale drinkers – like us! A hint of rye and wheat in the malt bill and a blast of Pacific Northwest hops in the nose balances creativity with drinkability. Mrs KB and I enjoyed this beer with shwarma dusted beef kabobs and potato salad. The combination bordered on eclectic, but it worked with the beer. The citrus in the lager was a bit stronger than expected as this was claimed to be a lager, but the bite melded with the vinegary potato salad. Also, although they call this a session beer, the 5.5% abv is high and the alcohol taste was surprisingly present, albeit not unpleasant. Shmaltz Slingshot Lager is under the Kosher Supervision of the KSA, as are many, if not all of the Shmaltz products.